Ever since Mon An Halal Vietnamese food stall moved out of their Eunos Crescent premise, I have been pretty much hankering for their fare. They took sometime before finding another suitable location. Btw, you can get updates on Mon An at their FB. 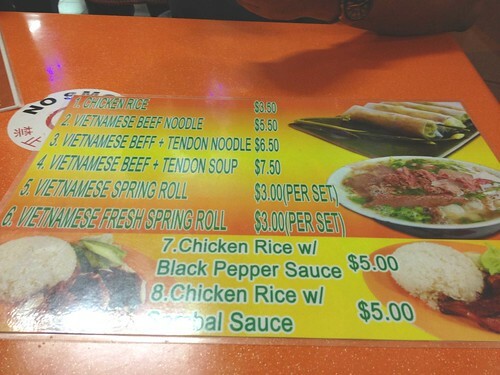 ANYWAY, my bro has been telling me that there's another Halal Vietnamese food stall at Kembangan. His student live in that vicinity and he always walked past that stall. I was determined to get him to bring me there one day. 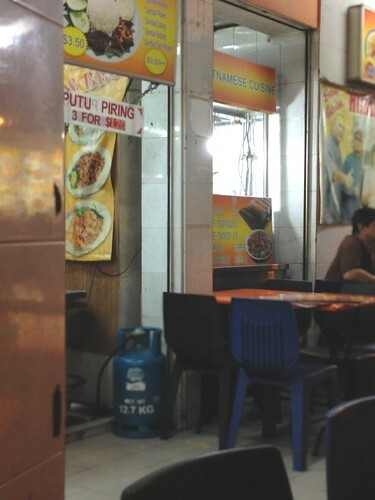 As it turn out, it was located within NoorJannah's Kitchen, an eating house located between Mon An's former stall locations. In fact, the stall assistant appear to be the same person who used to work at Mon An previously. 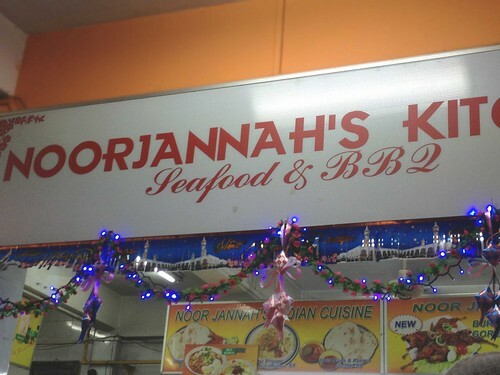 NoorJannah's Kitchen has quite a number of stalls serving different cuisines. There's the North Indian food stall selling naans and the likes. A prata stall, a stall selling crispy chicken rice (my bro's favourite! 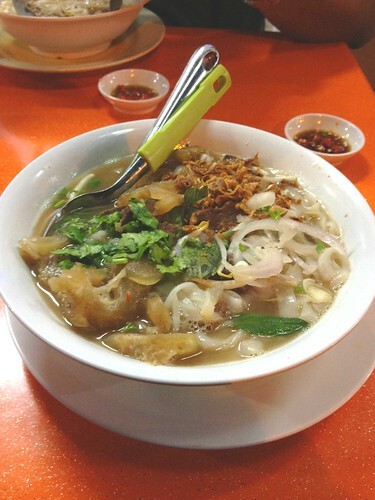 ), Malay food stall which also sell satay, the famous Bone Steak Horfun and or course, Vietnamese food. The stall was somewhat hidden in a nook but they do have some laminated menus placed on the tables to grab some attention. One look and I already knew what to get. My parents opt for the regular beef noodles while I chose the beef + tendon noodles. Tendon!!! They ran out of the 'Cha Gio' (crispy fried spring rolls) so we just settled for the 'Gui Cuon' (fresh spring roll/summer roll). My parent's bowl. In all honesty, it looked pretty dismal. 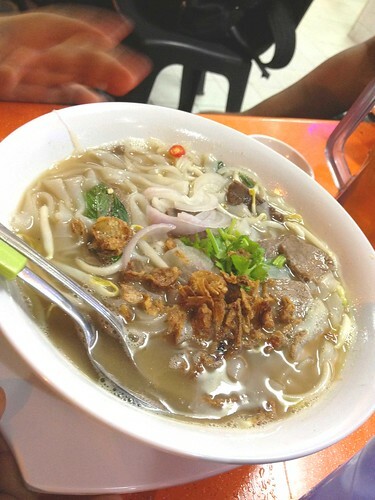 I mean, if you've seen pictures of the beef noodles from Mon An, you can see why. 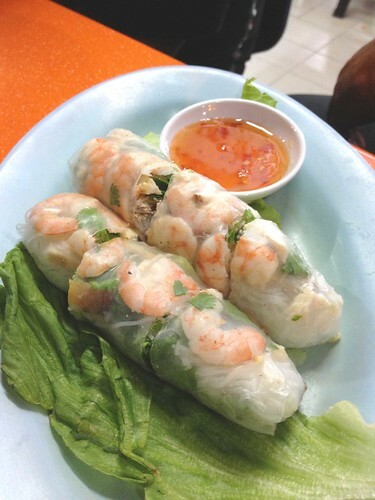 One, is the absence of a spoonful of 'Mắm Ruốc' (Vietnamese shrimp paste/hae ko/petis). And the generous topping of herbs like basil and 'Ngò Gai' (saw-tooth herb). My bowl came like 10 mins after my parents' bowl appeared. Maybe it's made to order? But it's worth the wait. The tendons were sooo tender! I love those. But not the beef slices though. One, they were sliced a tad thick. Secondly, they seemed pre-cooked (not fresh beef). Less tender too. This came like another 10mins after my bowl of noodles. It was decent, at most. There were more beehoon than herbs. And the shredded/minced chicken meat taste a tad weird. As the stall assistant cleared our table, he asked me if I've tried the 'authentic' version located there previously. I knew right on that he was talking about Mon An. So I told him that I was quite a regular. He woefully remarked that the fare from these 2 stalls are totally different. Especially with the absence of that 'Ngò Gai' (saw-tooth herb). I really have got to agree. And it's good that he thinks that way; for any unknowing person who saw him and that Vietnamese food stall, might mistakenly thought that Mon An is back at that vicinty. Looks like, after having been exposed to Mon An's authentic Beef Pho, every others just pale in comparison. I have yet to try Orange Lantern's rendition and Sedap Corner's version is pretty alright. But it's a tad pricey. Thanks for reading. You got me really curious with that juicy info and had me google it up. I believe the place is called, 'PHO 4A'?